Digital economies and cloud computing require extensive, affordable broadband access, which in turn requires incentives for private sector investment in infrastructure and laws and policies that support universal access. This section of the Scorecard examines and compares the infrastructure available in each country to support the digital economy and cloud computing. It is based on detailed comparative statistics on a range of important IT indicators, including the presence of a national broadband plan, a country’s International Connectivity Score and International Internet Bandwidth. In addition, the Scorecard includes statistics on the number of subscribers for key services, such as mobile broadband subscriptions. Despite major infrastructure improvements underway in a number of countries, broadband penetration remains very inconsistent. As a result, some countries continue to have low infrastructure scores. Countries that do not yet have sufficient infrastructure continue to be at risk of missing the economic benefits of the digital economy and cloud computing. Singapore, Japan, and Korea achieve the highest results in this section of the report. 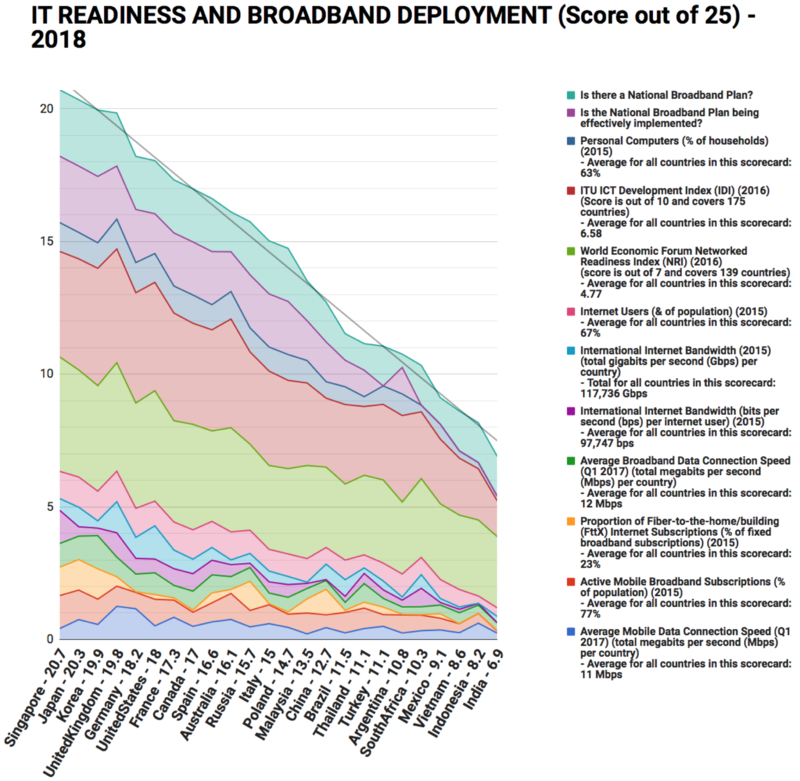 As IT readiness and broadband Deployment is worth 25 percent of the overall score in this year’s Scorecard, this strong result helps to lift the overall rankings for these countries. For example, Japan jumps from 10th in the Scorecard rankings to 2nd once the infrastructure scores are included. Most of the other countries in the Scorecard receive a similar ranking whether or not infrastructure scores are included. The poorest performers in this section of the Scorecard are Vietnam, Indonesia, and India.